1. Preheat the oven to 180˚C, gas mark 4. 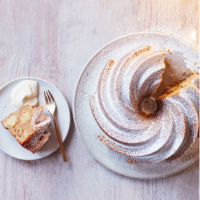 Brush a 2.4 litre bundt tin with ½ the melted butter, being careful to get it into all of the grooves. (We used the Nordic Ware non-stick heritage bundt pan * but any bundt tin will work. You could also use a deep, round 23cm cake tin instead; just grease and line it first.) Chill for 5 minutes, then coat with the remaining melted butter; dust all over with flour. Turn and tap the tin on the work surface to ensure every groove is coated with a light covering – this is key to ensuring the cake turns out cleanly. 2. Cream the butter with the sugar using a freestanding mixer (or electric beaters) on high for 10 minutes until very pale and fluffy. Meanwhile, combine the flour, spices and salt in a bowl and lightly whisk the eggs in a jug. Slowly pour ½ the beaten eggs into the butter mixture, while beating on a medium speed. Add a spoonful of the flour mixture, then beat in the remaining eggs. Fold in the rest of the flour mixture until just combined, then gently stir in the grated apple. 3. Spoon a little of the mixture into the tin, just to cover the base. Stir the chopped apple into the remaining mixture and pour into the tin. Spread the mixture with a spatula, creating a slight dip in the centre the whole way around the ring, to give an even rise. Bake for 45-55 minutes (if using a round cake tin, it might need 5-10 minutes more), until a skewer comes out almost clean (it will continue to cook slightly in the tin, so try not to overbake it). 4. Leave to cool in the tin for 20 minutes, then turn out onto a wire rack and leave until completely cool. Meanwhile, whisk the cream until just holding its shape. In a separate bowl, beat the mascarpone with a spoon until smooth, then stir in the cream and golden syrup. Dust the cake liberally with icing sugar and serve each slice with a dollop of the cream. Alternatively, serve warm with caramel sauce for an indulgent pudding.